Have you ever dreamt of being an entrepreneur or a business tycoon with an ability to shake the world with your business skills? You may want to quit your current job and start a business of your own but you do not have enough capital to invest in your business. In today’s era, digitalization has embarked a breakneck impact worldwide thus providing numerous scopes to those who want to step their feet in the business industry through e-commerce in the easiest ways possible and one such profitable and easy online business method is Dropshipping. 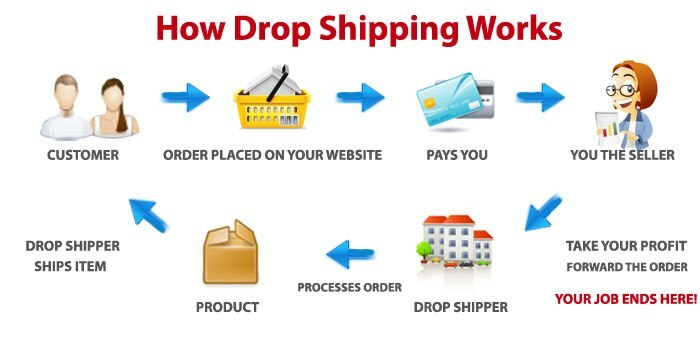 Drop shipping is a business model where retailers do not stock their online store with goods. Instead, they receive orders from the customers, purchase the goods from a third party supplier(manufacturer or wholesaler) at a cheaper rate, transfers the order and shipment details to the third party who then ships the goods directly to the customer. Dropshipping is an extremely hassle-free process where you do not have to own and maintain an inventory or stock or a shipping department as this is entirely managed by the suppliers. You just need to set up a well-designed online store, a reliable online system for payment, drive web traffic to your store through ads, make sales and earn profits. To be precise, it is a great way to make money online without any headache of hefty investment. a) Those who have a knack for e-commerce. b) Those who are highly active on social media networks. 1) One must possess the ability to create and promote one’s own web store. 2) Excellent marketing skills to gain customers by growing social media presence, enhancing the promotional activity of products, etc. wholeheartedly, resolving their queries, understanding them and providing the correct solutions. 5) Being adaptable in any prevailing business environment and make instantaneous changes to business during tough times. 8) Ability to incorporate the latest trend and technologies.